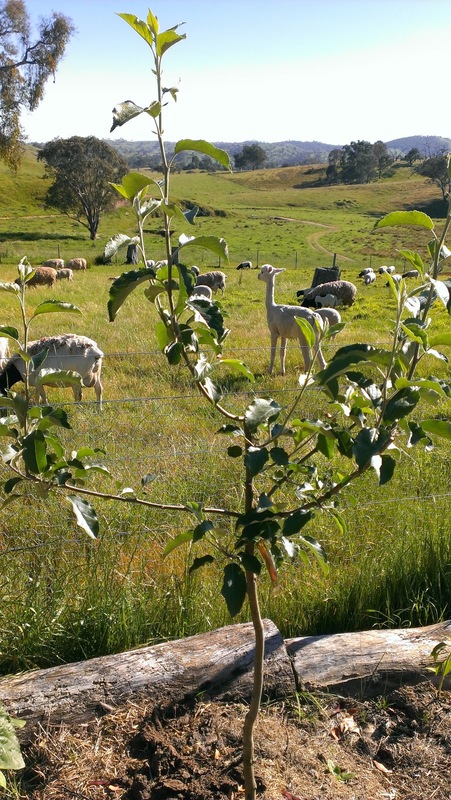 Over winter and into spring I've planted 25 trees - fruit trees all of them. When we moved to Highfield, nearly a year ago now, there was only 4 peach trees and 3 crab apples many of them in a poor state. The existing trees have been pruned and watered and they have somewhat revived. But now the fruit tree stock has been dramatically expanded with my cooler season plantings. What's in? Here is a list. All seem to be doing very well (with one exception) - in fact, the Mulberry is already fruiting producing the odd berry - they are tasty but a little dry - I think the mulberry needs more water. I have plans for more trees too - more pomegranates, more olives, a Tahitian lime in a protected little pocket, perhaps more apricots and some cider apples? I fancy a mini grove of pistachios and almonds. I fancy a walnut or two over by the shearing shed. What are your favourite fruit trees? Is there a variety you grow that I MUST have? What haven't I thought of that would work in our Mediterranean climate which also gets a frost? I have a peach tree, an apple I just planted and a really old pear tree that came with the property. I think it's great to be able to plant so many trees! I'm afraid I will be impatient in waiting for them to provide... that's really why I got them in at the first opportunity. If you are growing apricots then you MUST have a Blenheim apricot, they are the best flavored apricot, Moorparks pale in comparison. Oh, thanks for that Michelle, I will look out for Blenheim. Oh I'm positively green with envy - so much space!